IWM is rising as expected. Here are some target zones where the move might end. I know you have had to endure my cautious optimism over the past three months where I have focused on finding lows versus pounding the table to sell on highs but it has borne fruit in Russell 2000 and its corresponding ETF IWM which has pushed to a new high over that of January this year. While I expect it to attempt to reach higher into at least next month if not into August, it is wise to begin to lock in some profit by some combination of raising stops or taking partial profits on this new high. 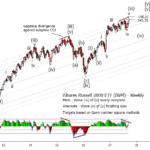 Next harmonic of the wide base channel is at 166.00. 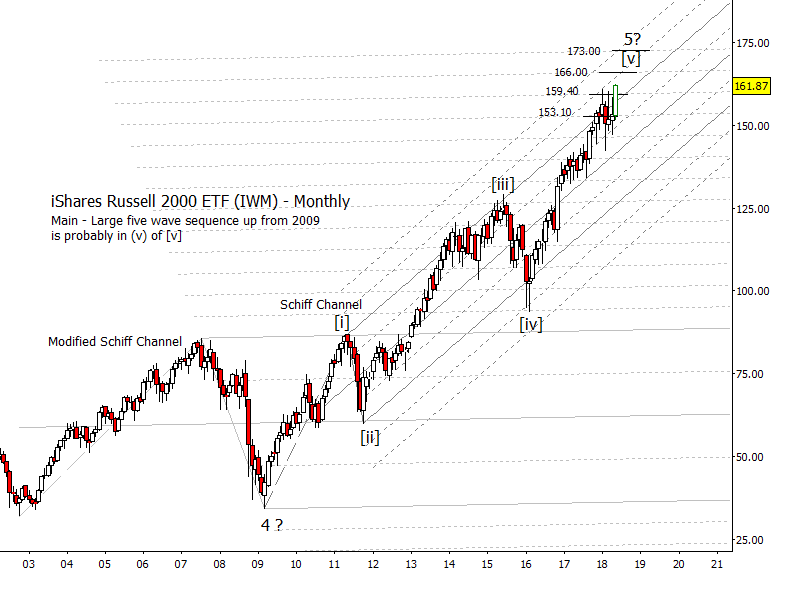 As a continuation of the post yesterday taking a look at the big picture, here is much the same but using the ETF for the Russell 2000 (IWM). 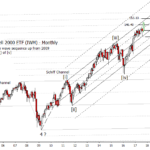 The idea expressed here is the same, that we are now in wave (iv) of [v] up from the 2009 low. Expect at least a few months of mostly sideways price action before a push to a new high. The theme from when I posted these remains the same from about a week ago. I just added the next steps up in the charts to keep an I on. The Russell 2000 is in a similar position as most of the other major indices. Probably in wave (iii) of [v] up from the 2009 low. This implies one more down/up move before any serious correction sets in.